Please ensure that you measure carefully for all cabinets and that all dimensions are maximum dimensions (e.g. varying floor heights, uneven walls and floors etc may result in varying measurements). Ready Made: Measure your radiator as detailed above. Now check that this size fits within (is equal to or less than) one of the INTERNAL sizes detailed in the size chart below. 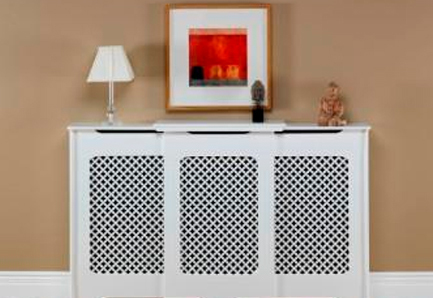 This is the minimum size ready made radiator cover you will require. All sizes and measurements detailed below are approximate for the standard ready made sizes but may vary slightly between styles/manufacturers. Please see each individual product's "Buy-Now" pages for definitive measurements. The max height is the actual max radiator height that will fit allowing the supplied internal fixings to be used and some airflow space. 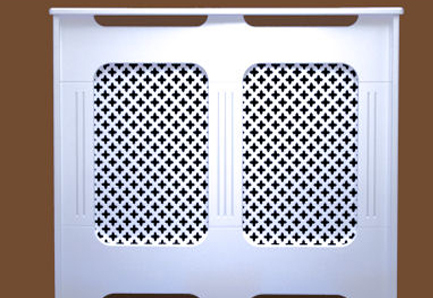 Note: The INTERNAL sizes are the MAXIMUM radiator size that this cover will fit over. You can of course have a larger radiator cover than the size of your actual radiator, but always make sure that the maximum EXTERNAL measurements will fit in your space i.e. check that window cill heights, alcoves or obstructions will not block where a larger radiator cover is to be fitted. Readymade: A standard skirting cut-out is pre-cut in all readymade covers; these cut-outs range from a maximum of 125-180mm High x 20mm Deep (Note: the cut out curves with a radius out to the edge of the board). You can of course make this cut out larger if required by masking the side panels, marking your required skirting cut and jig-sawing out the enlarged skirting size. Please note all sizes quoted for ready made covers have a 5mm margin of error. Please ensure your cabinet is kept in dry conditions prior to assembly as exposure to damp will result in a slight swelling of the MDF fibres and may render it difficult to assemble your cabinet as the parts need to fit into tight slots and rebates that are machined very accurately to ensure a tight fit so any swelling may make this difficult or impossible. All our covers are delivered flat packed. Minimal home assembly is required (approx 5 - 10 minutes), you will need a hammer and cross head screwdriver for assembly. For ready made covers they have a combination of assembly methods with either "push-fit" lugs and/or some cam bolts and screw fixings. Ready made cabinets will require you hammer 11 white fixing blocks (provided) in to pre-drilled holes Assemble the cover and screw through the white blocks with the screws provided. The cover is then ready for wall fixing. The whole cover is placed in to position against the wall and you mark the position of two fixing brackets (hook type screws with pozi heads). When these are fitted to the wall the whole cover clips over these brackets and into two routered grooves on the reverse of the top lid. Wall plugs for masonry walls (the most common walls for fixing rads and cabinets to) are provided in the fixing packs but obviously these are not suitable for all walls and in such instances, you would need to provide your own plugs. Removal of the whole cover for access takes just seconds, the whole cover surround can be taken away easily for full access. Radiator cover weight depends on size, covers are designed to be floor standing, but for safety we recommend that covers be fixed back to the wall to stop them falling forward causing injury or damage.